– If you want curls, but forgot your press and rollers, you can use a paper bag. The hair styling in this case is the same as curling with elastics. You just have to cut a large paper bag into strips and wrap slightly damp hair with them. – If you have oily hair, but no shampoo around you can take a package dry oatmeal. They absorb the oil as well as shampoo or powder for oily hair. Moreover, it is easily washed away. – Also can give you a trick if you have dry and brittle hair. In such cases use a mayonnaise as a hair mask. Our grandmothers and great-grandmothers have done and see how shiny hair had. Jokes aside, eggs and oil in mayonnaise are very good strengthener and moisturizer for hair. – Of course the natural products are the best, which save your hair and make it softer. 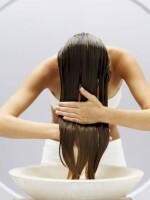 When you need more shine in your hair without products you can rinse your hair with vinegar while bathing. Best after application to leave it for a few minutes, then rinse your hair.